A hacker club has published what it says is the fingerprint of Wolfgang Schauble, Germany's interior minister and a staunch supporter of the collection of citizens' unique physical characteristics as a means of preventing terrorism. 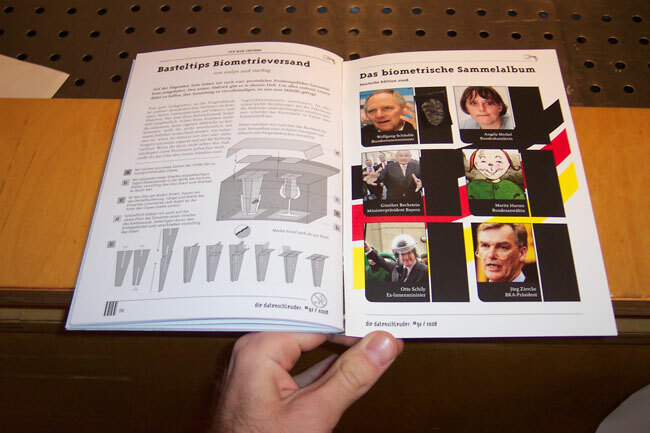 In the most recent issue of Die Datenschleuder, the Chaos Computer Club printed the image on a plastic foil that leaves fingerprints when it is pressed against biometric readers. No-one from the Germany-based group has been able to test the foil to see if it can fool a computer into believing it came from Schauble. But the technique has been shown to work with a variety of other people's prints on almost two-dozen readers, according to a colleague of the hacker who pulled off the demonstration. Nohl, a graduate student at the University of Virginia, acted as an English translator for Starbug, who speaks German. The two recently released research showing how to crack the encryption of a widely used smartcard in a matter of minutes. The print is included in more than 4,000 copies of the latest issue of the magazine, which is published by the CCC. The image is printed two ways: one using traditional ink on paper, and the other on a film of flexible rubber that contains partially dried glue. The latter medium can be covertly affixed to a person's finger and used to leave an individual's prints on doors, telephones or biometric readers. Nohl said Starbug has used the same film to store his own fingerprints and has successfully fooled 20 different biometric readers, including those deployed in Germany's own passport offices. The machines, made by a company known as Cross Match Technologies, are in the process of being rolled out by German customs officials at border checkpoints, Nohl said. Schauble is a big proponent of using fingerprints and other unique characteristics to identify individuals. “Each individual’s fingerprints are unique," he is quoted as saying in this official interior department press release announcing a new electronic passport that stores individuals' fingerprints on an RFID chip. "This technology will help us keep one step ahead of criminals. With the new passport, it is possible to conduct biometric checks, which will also prevent authentic passports from being misused by unauthorized persons who happen to look like the person in the passport photo." The magazine is calling on readers to collect the prints of other German officials, including Chancellor Angela Merkel, Bavarian Prime Minister Guenther Beckstein and BKA President Joerg Ziercke. "The thing I like a lot is the political activism of the hack," said Bruce Schneier, who is chief security technology officer for BT and an expert on online authentication. Fingerprint readers were long ago shown to be faulty, largely because designers opt to make the devices err on the side of false positives rather than on the side of false negatives. Few readers, he said, have ways to verify the input path to prevent spoofing, and yet politicians frequently see them as a panacea for all kinds of complicated security problems.